If you find you can no longer work due to your health, contact an experienced Social Security disability lawyer for help with your claim. Don’t suffer in silence, if you were injured in a car accident—call an auto accident attorney who will fight to get the compensation you deserve. Do you have a loved one who’s been neglected or abused in a nursing home? Seek justice with a lawyer who will hold the nursing home accountable. Truckers who are injured while on the road turn to Sutterfield Law Offices for diligent representation. Are you ready to speak with an experienced lawyer about your situation? Call now to schedule a free consultation with Sutterfield Law Offices, and rest assured that your case will be in capable hands. 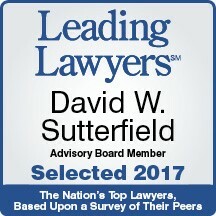 When you partner with Sutterfield Law Offices, you’ll receive personal service from experienced lawyers, who truly care. We’ll listen closely to the details of your situation, address your concerns, and help you decide on the next best steps. No matter what, we’ll be by your side at each stage of your case. When you are faced with difficult legal issues, you may feel lost, and not know where to turn. Sutterfield Law Offices, P.C. offers over 33 years of experience in helping people just like you. There’s no need to wait—contact us now so we can get started right away on your case.